My daughter who is 3 is obsessed with chickens. She has a hen that hatched 6 chicks and she spends a lot of her time with the chickens. For Halloween she asked to be a chicken. Haha. So because I have a 4 month old son as well, I made them both chicken costumes, hers the mother hen and his the baby chick hatching from its egg. I used feather boas and attached them to their shirs to make the body, used felt to make the combs and glued them to a tobogan. The legs were tights that I dyed yellow and the feet were rubber gloves (I stuffed the fingers to keep them stiff). For hers, I also used a piece of thread to lift the tail and secured it to her back so that when she walked the tail would sway. For him I used a pillowcase and made jagged edges which I glued together and stuffed to create a cracking egg. 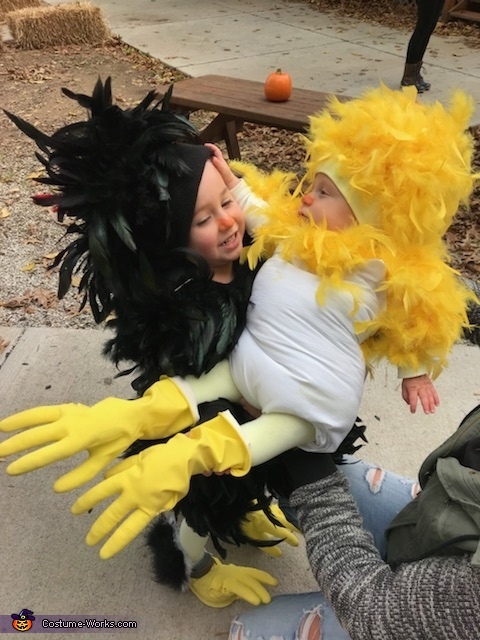 Both of them loved their costumes, he had a mouth full of feathers all day while she still asks to wear her chicken costume around the house!